Dams required for harnessing Water Resources through storage and regulation are of great economic necessities especially in developing countries for catering to the various demands like drinking water irrigation, hydro power generation and industrial needs etc. Dams required for harnessing Water Resources through storage and regulation are of great economic necessities especially in developing countries for catering to the various demands like drinking water irrigation, hydro power generation and industrial needs etc. As these hydraulic structures require huge capital outlay, besides confer economic benefits safety of these structures is of paramount importance as any failure of these structures not only cause loss of life and damage to property but also affects economy of the country. It is as such imperative that safety of dams is ensured in all its aspects which enjoins dam engineers to design build and maintain our dams to the highest standards as per current practice. Some experts opine that dam engineering originated in India taking into account reference made in our ancient scriptures thousands of years old with regard to the selection, suitability of site besides the need for services of good hydrologist to assess the flows. Dams built thousands of years ago are still serving the needs for which they were constructed. During the last four decades, a large number of dams have been constructed in this country for harnessing the Water Resources for economic benefits like irrigation, hydropower generation, industrial needs and drinking water needs etc. It is estimated that there are more than 3500 large dams in this country. Existing Dams constructed in earlier times, not conforming to current design practices also merits equal attention with regard to safety aspects through strengthening measures. Dam Safety is thus of great importance and calls for multi-disciplinary approach. The life of the dam can be threatened by natural phenomenon such as floods, earthquakes, landslides, deterioration of construction materials. The major causes of failure are due to foundation failure, inadequate spillway capacity poor construction uneven settlement etc. These problems are due to foundation deficiencies, erosion of foundation, seepage through dam, erosion of downstream face deterioration of materials, poor maintenance of electrical and mechanical equipment inadequate study of earthquakes etc. 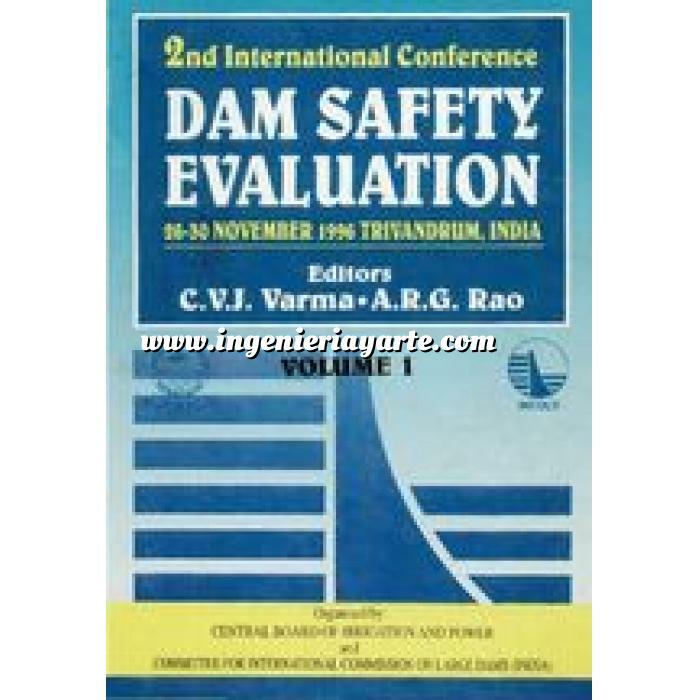 It is in this context that the Central Board of Irrigation and Power (CBI&P) and the Indian Committee for International Commission on Large Dams, India (INCOLD) are organising the Second International Conference on Evaluation of Dam Safety at Trivandrum so that this can provide scope for interchange of experiences to facilitate flow of state of art technology in all aspects of dam safety, especially considering participation of eminent dam experts from all over the world. Kerala the venue of the Conference can boast of some old dams as well as the modem Idukki Dam which the delegates We are sure will have the opportunity of visiting. Thanks are due to the authors for their valuable contribution of technical papers of highest excellence contributing to the development of dam engineering. We owe a debt of gratitude to Chairmen, Vice-Chairmen and Members of Organising Committee and Technical Committee and Local Organising Committee for their invaluable contribution. We also acknowledge the assistance of local authorities including Irrigation Department, Govt. of Kerala, and Kerala State Electricity Board in the organisation of this conference besides to other agencies SNC + LAVALIN Inc. Hydroplus International etc. for their financial support. Thanks are also due to Oxford & IBH Publishing House for bringing out the proceedings volumes in an excellent fashion despite the constraints of time.